This year Hawaii is the host of two(!) total lunar eclipses: One at April 14 and one at Oct. 8. The lunar eclipse of April 14th starts just before 7 pm Hawaiian time and ends half an hour after midnight April 15. 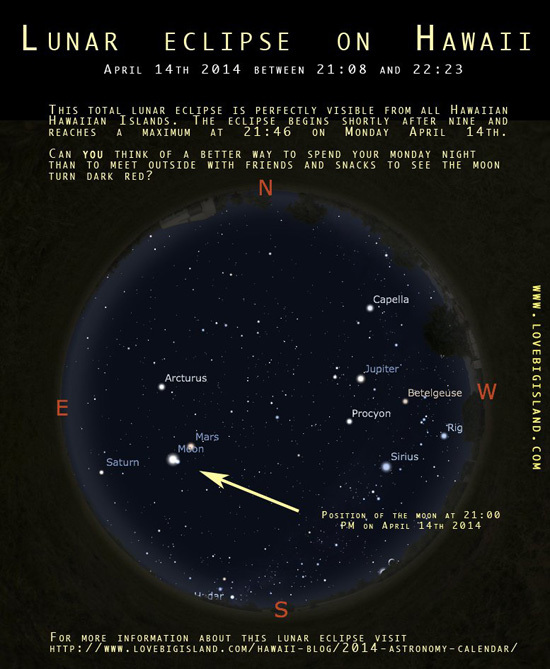 The moon will be totally eclipsed between 21:08 and 22:23 April 14. The best time to see the eclipse is between 21:30 and 22:00. Below you can find a sky chart of the Hawaiian skies on April 14 just before the full eclipse starts.